Welcome to Math Tech, a monthly column about technology-based supports for students with special needs in the mathematics classroom. I taught high school special education mathematics for 13 years in a center-based program for students with severe emotional impairment. During my time in the classroom, I tried a range of low- and high-tech strategies to engage my students and help them experience success with mathematics. In this column, I will share tech-based interventions that were successful in my classroom, as well as new products, strategies and perspectives that continue to surface in the vast world of educational and assistive technology. All students can learn, and all students can learn math. Our job as educators is to discover and implement ways to help students express what they know and then to grow what they know. One way is through technology. For this first column, I want to tell you about my favorite low-tech tool that I used with great success for many years. Algeblocks (or Algebra Tiles, same concept, different feel) are manipulatives to teach anything from counting, to whole number/integer/algebraic operations, simplifying expressions (even quadratics and polynomials), and solving equations. 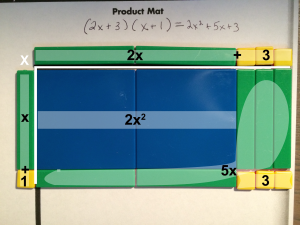 Whether you use Algeblocks or Algebra Tiles, students use a unit, x, and x2 manipulatives, along with an addition/ subtraction mat, equations mat, or multiplication/division mat. 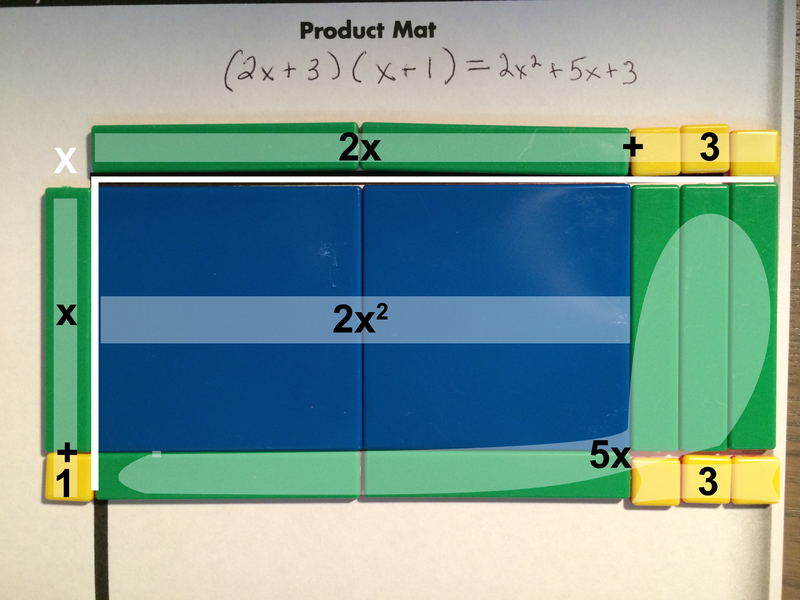 An Algeblocks mat illustrating a graphical way to show that (2x+3) times (x+1) equals 2x squared plus 5x plus 3. I used Algeblocks because they addressed my students’ strengths as visual, nonverbal learners and minimized their difficulties, such as fact retrieval, memory, and organization. Algeblocks use visual models to demonstrate math concepts and minimize the need to memorize math facts, be a fluent reader, or keep lengthy calculations organized on paper. If you can’t buy class sets, take a look at the National Council of Teachers of Mathematics (NCTM) Illuminations applet or the My HRW Algebra Tiles applet. As a new teacher assigned to high school mathematics without a mathematics degree, learning new teaching methods and materials was intimidating, if not overwhelming. Only after a few years of figuring out how to be a teacher, did I feel ready to tackle conceptual math tools like Algeblocks. The effort was well worth it. Students readily used the materials, felt empowered as math learners, and derived their own understanding based on their use of the manipulatives. I look forward to sharing many more technology resources to support mathematics education for students with special needs, and I welcome questions and feedback. Please feel free to contact me at kate.fanelli@misquared.org. Kate Fanelli is a math accessibility specialist for Michigan’s Integrated Mathematics Initiative (Mi)2, a state initiative that promotes and supports high quality mathematics education for ALL students. Follow (Mi)2 on Facebook (www.facebook.com/mi2.page) or on Twitter (@MI2_Math). Contact Kate at kate.fanelli@misquared.org. Tagged Algeblocks, Algebra Tiles, Kate Fanelli, math, MathTech, My HRW Algebra Tiles, NCTM Illuminations. Bookmark the permalink.